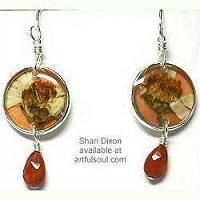 Shari Dixon's jewelry incorporates natural elements such as flowers, leaves and feathers, utilizing shell and wood as a canvas behind the final arrangement. The pieces are sealed with a clear resin that preserves the forms and immortalizes their fragile, otherwise fleeting lives. 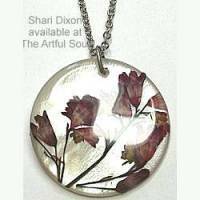 Shari's design career started in New York, from silversmithing to this distincitve work, which is now done in her Tennessee studio. 1-1/2 inches long including sterling earwire, 3/8 inch across. Beautiful medium and navy blues of the Forget Me Knot flowers on green stems, stand out on luminous mother-of-pearl white shell background, covered in clear resin for shine and depth. Forget Me Knots symbolize true love, the human longing for lasting love and, of course, remembrance. 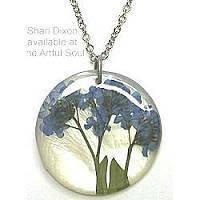 1-1/4 inch round pendant has luminous mother-of-pearl shell background, upon which the beautiful medium and navy blues of the Forget Me Knot flowers on green stems, stand out. Covered in clear resin for shine and depth. Forget Me Knots symbolize true love, the human longing for lasting love and, of course, remembrance. Suspended from 16-17 inch antiqued silver plate chain with lobster clasp. 2-1/8 inches long including sterling earwire, 3/8 inch across. 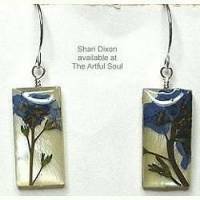 Beautiful medium and navy blues of the Forget Me Knot flowers on green stems, stand out on luminous mother-of-pearl white shell background, covered in clear resin for shine and depth. Blue stone drop at the end. Forget Me Knots symbolize true love, the human longing for lasting love and, of course, remembrance. 1-3/4 inches overall length, 7/16 inch across. 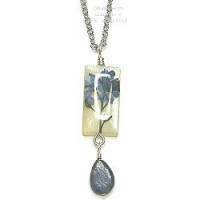 Pendant has luminous mother-of-pearl shell background, upon which the beautiful medium and navy blues of the Forget Me Knot flowers on green stems, stand out. Covered in clear resin for shine and depth. 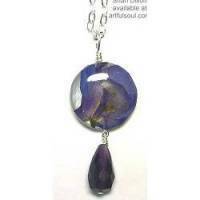 Blue stone dangles below. Forget Me Knots symbolize true love, the human longing for lasting love and, of course, remembrance. Suspended from 16-17 inch antiqued silver plate chain with lobster clasp. 2 inches long including sterling earwire, 5/8 inch across. 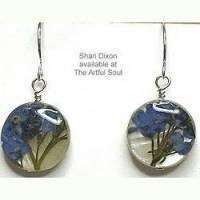 Beautiful medium and navy blues of the Forget Me Knot flowers on green stems, stand out on luminous mother-of-pearl white shell background, covered in clear resin for shine and depth. 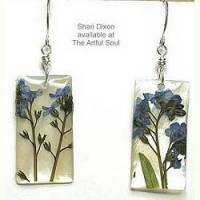 Forget Me Knots symbolize true love, the human longing for lasting love and, of course, remembrance. 1-3/4 inches long including sterling earwire, 5/8 inch across. 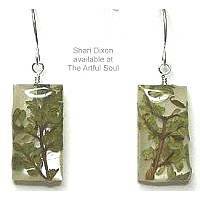 Delicate green real oregano leaves with brown stems, mounted onto luminous mother-of-pearl shell, covered in clear resin for shine and depth. 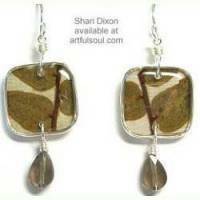 Small faceted brown stone dangles below. Thyme is one of the best known and most widely-used culinary herb and is a symbol of strength and courage. 1-1/2 inches long including sterling earwire, 3/8 inch across. 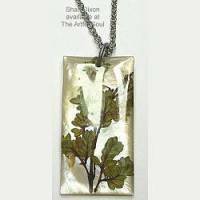 Delicate green real oregano leaves with brown stems, mounted onto luminous mother-of-pearl shell, covered in clear resin for shine and depth. Thyme is one of the best known and most widely-used culinary herb and is a symbol of strength and courage. 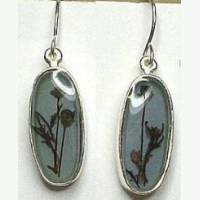 1-1/4 inches long including sterling earwire, 5/8 inch across. 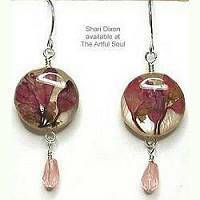 Deep magenta and lighter pinks of the Coral Bell petals with brown stems, mounted onto luminous mother-of-pearl shell, covered in clear resin for shine and depth. This Coral Bell is the Henchera "Milan" variety, fashionable and charming in its constant bloom of lovely warm pink flowers. 1-1/4 inch round pendant. 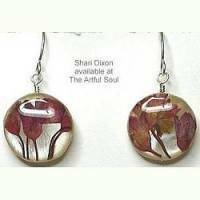 Deep magenta and lighter pinks of the Coral Bell petals with brown stems, mounted onto luminous mother-of-pearl shell, covered in clear resin for shine and depth. This Coral Bell is the Henchera "Milan" variety, fashionable and charming in its constant bloom of lovely warm pink flowers. Suspended from 16-17 inch antiqued silver plate chain with lobster clasp. 1-3/4 inches long including sterling earwire, 5/8 inch across. Deep magenta and lighter pins of the Coral Bell petals with brown stems, mounted onto luminous mother-of-pearl shell, covered in clear resin for shine and depth. A pale pink stone dangles below. This Coral Bell is the Henchera "Milan" variety, fashionable and charming in its constant bloom of lovely warm pink flowers. 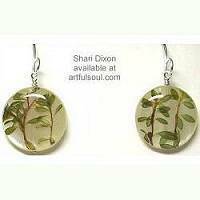 Pendant is 7/8 inches long, 5/16 inch across. 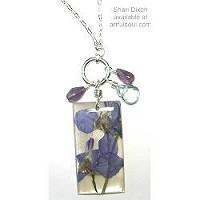 Antiqued silver plated pewter oval frame holds a dusk blue background upon which the Smoke Tree Blossom in dark pink/purple and greens stands out, covered in clear resin for shine and depth. Smoke tree gets its common name from the frothy, fluffy summertime bloom clusters. Its native range is from Tennessee to Oklahoma and south-central Texas. 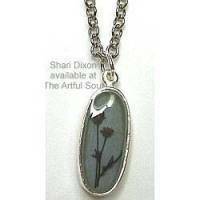 Suspended from 16-17 inch antiqued silver plate chain with lobster clasp. 1-3/8 inches long including bail loop, 13/16 inch across. 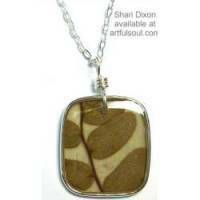 Olive-Brown leaves on a parchment color background are captured in silver plated bezel cup. Suspended from 16 inch sterling chain. 1-3/8 inches long including bail loop, 7/8 inch across. 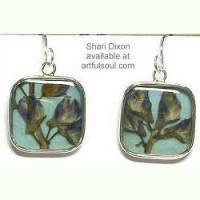 Lupine flowers in periwinkle and natural brown colors are highlighted in the aqua color background, sealed within a in silver plated bezel cup. Suspended from 16 inch sterling chain. 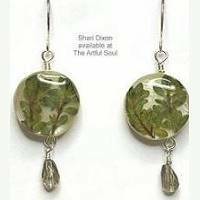 1-1/4 inches long including sterling earwire, 5/8 inch across. 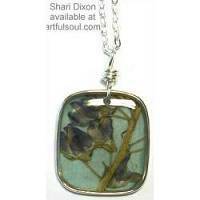 Lupine flowers in periwinkle and natural brown colors are highlighted in the aqua color background, sealed within a in silver plated bezel cup. 1-1/2 inches long including bail ring, 1-1/8 inch across. 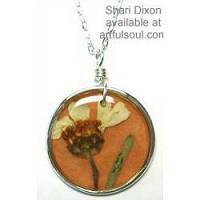 Zinnia flowers in orange and natural colors are highlighted in the melon orange background, sealed within a in silver plated bezel cup. Suspended from 16 inch sterling chain. 1-1/2 inches long including sterling earwire, 3/8 inch across. 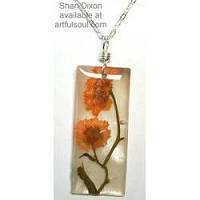 The fresh orange colors of Achillia flowers are sealed on top of luminous white shell. 2-1/8 inches long including wire bail, 3/4 inch across. 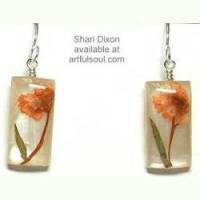 The fresh orange colors of Achillia flowers are sealed on top of luminous white shell. Suspended from 16 inch sterling chain. 1-3/4 inches long including wire bail, 1/2 inch across. 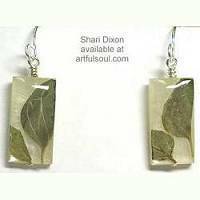 The mossy green leaves of Oregano are sealed on top of luminous white shell. Suspended from 16 inch sterling chain. 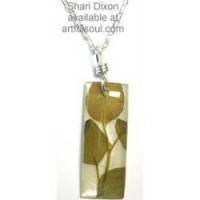 Read about what others think of Shari Dixon jewelry! Instead of reviews for a specific product, this is a place to share about the designer line in general.